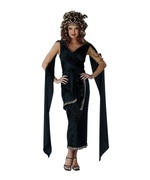 The Dark Goddess costume for women includes a black bodysuit with shimmery strap trims, sheer shoulder drapes, and an attached pleated panel skirt. The matching gold-trimmed black arm gauntlets and a golden O-ring headband are also included. The costume won't include any shoes with your purchase. The Dark Goddess costume for women is currently available in these three women's sizes: small (4-6), medium (8-10), and large (12-14). All must bow down to your power once they see you dressed as not a queen, not a warrior, but a Goddess! 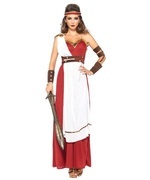 Feel the awesomeness of a Goddess with the purchase of the women's Dark Goddess costume! Review(s) for " Dark Goddess Women Costume"